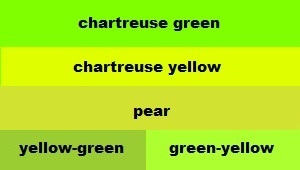 Chartreuse Color - What Color is Chartreuse? Chartreuse is a shade between the colors green and yellow, but it is typically considered a sub-category of the color green. The color was named after a French liqueur called “chartreuse” which has a greenish-yellow hue. The liqueur was first produced in 1605 by the Carthusian monks of France, but likely not marketed to the public until the 1730s. The name of this drink was first used as a color name in the year 1884 when it was mentioned in a British fashion newspaper. During the late 1800’s silk and velvet fabrics were being produced in chartreuse and used to make such stylish items as feather fans, gowns, purses, shoes, and hats. In the roaring 1920s, chartreuse was a very popular choice for dresses because of its bold and rebellious nature. 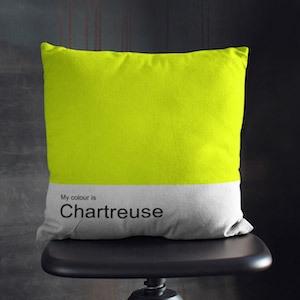 Chartreuse resurged in the late 1950s as a common color choice for clothing and furniture. In the 1960’s, its boldness appealed to young people. It was a unique color that could be used in both psychedelic color-schemes and nature-oriented palettes. Famous fashion designers began incorporating chartreuse heavily into their creations. Though the color fell out of favor in the 1970s, it had a comeback in the late 1980s. In the 2010’s, chartreuse became favored as a decorative color in offices of tech companies because the color reflects individuality and creative thinking which are highly valued attributes in the field of technology. Chartreuse can be seen throughout nature in many different plant species. Some common foods are considered to be chartreuse colored including pears, green apples, pistachios, limes, and avocado flesh. The gemstone tourmaline can be found in the shade of chartreuse. Because it is bright and easy to spot, chartreuse is used for tennis balls, fishing lures, and reflective safety vests. Chartreuse represents enthusiasm, happiness, nature, growth, and youth. Like standard green, chartreuse is associated with the liveliness and the blossoming of spring. 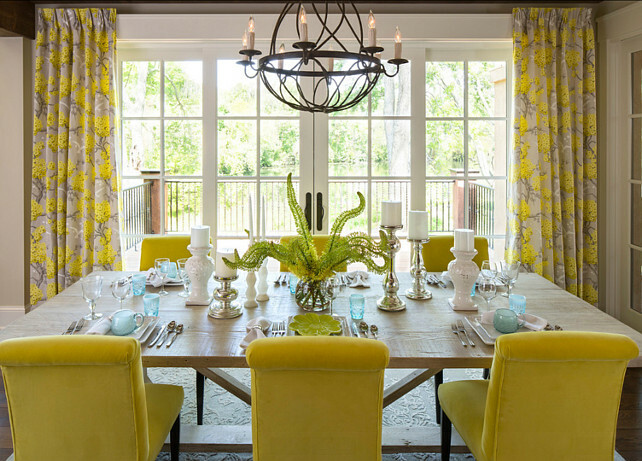 Unlike deeper shades of green, chartreuse is rarely associated with calm and relaxation. It’s seen as a highly energetic color and is great for inspiration and motivation. It helps with focus, concentration, and creativity. People who like chartreuse are energetic and creative above all else! Their enthusiasm and positivity make them lovable, and they make friends easily. Chartreuse lovers enjoy challenges and seek adventure. On the negative side, people who gravitate to chartreuse struggle to find balance in their lives. They are caught between the calmness green offers and the excitement of yellow. This struggle can cause them to have high-levels of anxiety.